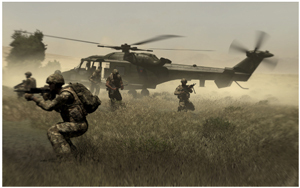 Canadian publisher Meridian4 is excited to announce the release and availability of the first official add-on to Arma 2 – Operation Arrowhead in the form of DLC named Arma 2 – British Armed Forces. The downloadable content is now available on their site for $9.99. Ottawa startup GlitchSoft Corporation has launched their first title for Apple’s iPhone, iPad and iPod Touch platforms. BarStar is a casual, time management, bartending game similar in gameplay style to Sally’s Spa and Diner Dash, that allows the user to enter the world of owning their own bar. The goal of the game is to quickly serve as many customers and collect tips and bonus points in each of the 35 timed levels. 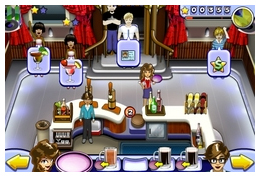 Using the bonus points earned from each level, players are able to purchase items to upgrade the bar and their bartending skills. By the end of 35 levels, the small, one roomed bar the game starts with will be transformed into a full fledged bar. Featuring an original score, stunning graphics and a deep story line, BarStar is an immediately addictive and engaging game. – Mix drinks using our innovative multi-touch system. Drinks include beer and wine in the early levels and cocktails including Screwdriver, Caesar and Strawberry Daiquiri in the advanced levels. BarStar is available internationally, and is currently on sale at an introductory price from the App store for $2.99. Today at E3, Ontario game developer Silicon Knights announced its exciting collaboration with McMaster University, the Art Gallery of Hamilton (AGH) and Mohawk College. The partners will work to create a new research institute around interactive digital media that will pioneer and shape cutting-edge advances in the interactive entertainment arena. The initiative, called “Eight: The Hamilton Institute for Interactive Digital Media,” will be located at McMaster Innovation Park in Hamilton and will debut in 2011. The joint venture centers on the development of the “8th Art,” art that develops technology and creativity beyond the moving image, i.e. film, and adds interactivity. The Institute’s focus will be on the creation and integration of new technologies, new design and innovative artistic concepts for digital media applications. “Eight” will provide a nucleus where staff of Silicon Knights and the AGH and faculty and students at Master University and Mohawk College can move seamlessly between organizations on shared research projects and digital media development. Staff of Silicon Knights and AGH could participate in research, course development and teaching at the new Institute. “By adding interactivity to moving images such as film (the ‘7th art), we are creating what Silicon Knights’ has dubbed for many years as the ‘8th Art’,” said Silicon Knights President Denis Dyack. “We have been promoting the ‘8th Art’ for many years, and are beyond excited to have aligned with three outstanding partners – McMaster University, AGH and Mohawk College – that share the same vision, and understand the need to grow the talent and resources in this arena. The partnership brings together several prominent groups whose talents and synergies will result in a groundbreaking initiative. Silicon Knights brings its development and creative expertise, which complements the talented faculty at McMaster, a leading research-intensive university with a track record of world-class research and education capabilities. AGH, a leading public art gallery that positions digital art as one of its key artistic activities through research exhibition and education, has a solid track record of engaging, stimulating and enriching the community through art, and this expertise will be compounded by talented faculty and staff at Mohawk College, with its keen focus on and responsiveness to industry and market trends. The council of Canadian Academies has identified new media as having the greatest momentum and the highest growth prospects of Canada. Worldwide the digital media sector is one of the fastest growing industries in the knowledge economy, projected to be valued at US $2.2. trillion over the next five years. This program will help grow the innovation and commercialization efforts in this key strategic sector of the new knowledge and creative economy. Gormley – Digital Leisure has announced that their newest title, Fast Draw Showdown, designed exclusively for Nintendo’s WiiWare™ game service is now available for download. When it comes to fast draw there are only two types of people: the quick…and the dead! Now you have the chance to find out where you stand, or lie, as the case may be. You’ll go up against the best quick draws in the business, including one of the world’s fastest, Wes Flowers. Unholster your Wii Remote™ and show’em who the fastest draw really is, in this live action shooter – a first for the WiiWare service! 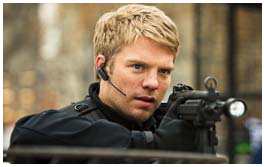 Once you’ve mastered your shootin’ skills, take on all your friends to see which of you really has the quickest draw. You’ll need some serious speed and awesome accuracy to take on these gunslingers…so get ready for some real fast draw action! Fast Draw Showdown is available today in North America and later this month in Europe, exclusively on WiiWare for 500 Wii Points™. Fast Draw Showdown is rated T by the ESRB. Montreal – Ludia’s new title Hell’s Kitchen Vs., which is based on the U.S. TV phenomenon where world-renowned chef Gordon Ramsay puts aspiring chefs through rigorous culinary tests is also now available on WiiWare. The game recreates the show’s pressure-cooker atmosphere as two players battle head-to-head in an arcade-style kitchen challenge. Try to conquer your opponent in each time-management test, while taking the heat of Gordon Ramsay judging and rating your performance at every stage of the game. Designed for 1 or 2 players, Hell’s Kitchen Vs is rated E by the ESRB and costs 800 Wii Points to download from the WiiWare store. London ON – Big Blue Bubble also has a release out on WiiWare today. Pub Darts is a simple darts simulation which uses the Wii Remote™ controller’s unique controls to mimic dart-throwing motion. The game is set in a local pub where the players will settle in to play some of their favorite dart games, including 501, Cricket, Around the Clock, Killers and Baseball. Controls function just like throwing a real dart. Players are able to create their own personal profiles, including selecting their avatar image from a collection of creative characters and the design they would like displayed on the dart flights. Pub Darts is rated E by the ESRB and is downloadable for 500 Wii Points. 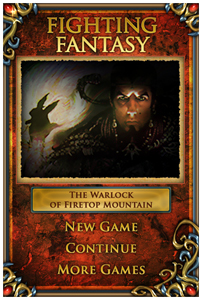 Also out today is Big Blue Bubble’s first Fighting Fantasy game book, The Warlock of Firetop Mountain, now available on iPhone and iPod Touch for $2.99usd. For the first time ever, you have the opportunity to explore the world of Titan on a portable screen bringing the adventure with you wherever you go. Experience the book that started the massively popular series which has sold over 15 million copies worldwide and set a new standard in roleplaying excellence. This exciting game plunges you into a thrilling adventure to the top of Firetop Mountain and its vast treasure, ruthlessly guarded by a powerful Warlock. Will you have the courage, tact and skill to survive where none have returned to tell the tale? Following the successful Nintendo DS launch of the game of the same name, Fighting Fantasy: The Warlock of Firetop Mountain for iPhone and iPod Touch takes a different approach bringing Ian Livingstone and Steve Jackson’s legendary game book to your favorite handheld device. Scroll through the pages effortlessly by tapping the screen to flip pages, roll dice by shaking your iPhone and experience the breathtaking tale that has sold millions of copies. Fighting Fantasy readers will be excited to know that Big Blue Bubble will be releasing four more titles in the series. In January, look out for Deathtrap Dungeon as it makes its iPhone debut providing the user with the same level of adventure, excitement and ease of use that The Warlock of Firetop brought. Fighting Fantasy fans will love the classic story and original illustrations with a technological twist. No more dice, pencils, or bookmarks. All the special features are built in! Vancouver – The call for submissions to present content for lectures, roundtables and panel sessions for the 2010 Game Developers Conference® Canada (GDC Canada) is now open through midnight, Tuesday, January 5, 2010. GDC Canada serves as a nexus point for established and promising young studios to learn best practices for developing new global titles and understanding emerging digital distribution models. The second annual GDC Canada is presented by Reboot Communications and Think Services, the organizers of the industry-leading Game Developers Conference. 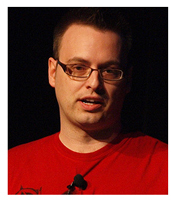 GDC Canada 2010 will return to the Vancouver Convention Centre in Vancouver, BC from May 6-7, 2010. Canada houses more than 260 videogame and digital entertainment studios and an ecosystem of more than 60 universities focused on gaming studies. With this accomplished community of national and international talent to draw from, Vancouver’s GDC Canada is the premier event for professionals to discover new insights into developing popular international titles, managing established franchises and taking advantage of thriving digital distribution models. Victoria – VIATeC is pleased to announce the opening of the nomination period for the 2009 VIATeC 25. The VIATeC 25 is an annual listing of the largest technology companies headquartered or founded in Greater Victoria based on revenue. To be eligible for inclusion in the VIATeC 25 please check our guidelines. Companies listed on the VIATeC 25 will be announced at the exclusive VIATeC Christmas Party on December 17 where members will gather to celebrate the end of another successful year. Results will also be published on the VIATeC website and in the media. For more information or to submit a nomination please contact Michelle. Cut off for nomination submissions is December 14, 2009. To RSVP for VIATeC’s Members Only Christmas party on Dec 17 at Sauce Restaurant & Lounge from 3:30 pm please email our office. Calgary – Digital Alberta has announced their New Year’s Evolution event with strategic innovation practitioner, international lecturer and author Alexander Manu. Held in partnership with the Canadian Marketing Association and Telefilm Canada, New Year’s Evolution will take place on January 19th at Calgary’s Theatre Junction Grand and Velvet Lounge. Tickets are $55 for DA or CMA Members and $95 for Non-Members. The first person to guess the address of Ubisoft Toronto’s new studio location wins a copy of Avatar The Game (from Employee #1 – you must enter via his Facebook page). Terrace – Rusty Axe Games, a developer and publisher of downloadable game software, is proud to announce the release of Real Estate Empire 2 version 1.0! Real Estate Empire 2 is the sequel to our popular game, Real E$tate Empire! For the real estate mogul in everybody, Real Estate Empire 2 contains over thirty different levels packed into four different scenarios. Real Estate Empire 2 features a streamlined upgrade and renovation system that makes the game easier to pick up and play. Real Estate Empire 2 also features a new goals based system that has players leveling up through a variety of different scenarios and goals. The much requested feature of renting has been added – do you wait for good renters who won’t damage your newly renovated bungalow or do you get somebody in there to start paying the mortgage today? Real E$tate Empire 2’s user friendly difficulty system allows players of all ages and capabilities to enjoy the game. Players will be entertained for hours while learning about real estate management at the same time! Real Estate Empire 2 is the real estate game that teaches you how to win… at the real estate game! Montreal – Today Ubisoft announced that Prince of Persia: The Forgotten Sands™ video game is in development and is scheduled to be released May 2010 for consoles and handhelds. This new installment in the critically-acclaimed franchise marks th e return to the Prince of Persia® Sands of Time storyline. Prince of Persia: The Forgotten Sands™ will feature many of the fan-favorite elements from the original series as well as new gameplay innovations that gamers have come to expect from the Prince of Persia brand. Tune in to Spike TV’s “Video Game Awards 2009” on Saturday, December 12, 2009 at 8 p.m. EST for the exclusive world premiere of the Prince of Persia: The Forgotten Sands™ trailer. Gormley – Digital Leisure has announced that two of their latest titles are now available in North America. Copter Crisis, a chopper sim which puts you in the pilot’s seat is available in the WiiWare Store for 500 Wii Points. As a member of the elite Helicopter Rescue Squad, you’ll be assigned to respond to any type of emergency anywhere at any time. You’ll have to complete various missions with the latest in helicopter rescue technology. When you’re ready, you’ll be tasked with executing rescue missions all around the Black Rock Canyon. Your Wii Remote controller becomes the control stick as you guide your copter along the canyons while avoiding rocks, severe weather and even anti-aircraft fire. Rescue lost hikers, deliver supplies to remote areas, assist on scientific missions and even blast your way into underground cavern systems. Complete all of your objectives and rise through the ranks to take on the toughest rescues and unlock 10 bonus missions. Nintendo® Wi-Fi Connection Pay & Play allows you to enhance your flight experience with 10 additional copters, which can give you access to unlimited missiles, larger fuel tanks, cargo holds and even mid-air loops. Sudoku Challenge!, designed exclusively for the Nintendo DSi™ Shop can be downloaded for for 500 Nintendo DSi Points™. With over 100,000,000 unique Sudoku puzzles, you’ll never see the same puzzle twice in Sudoku Challenge! Get started by selecting the classic nine-by-nine Sukodu gameboard or really take up a challenge with Grand Sudoku by completing five intersecting Sudoku boards simultaneously – A first for the Nintendo DSi™! 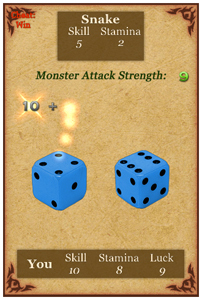 With three difficulty options even the most novice player to complete a Sudoku with ease. It’s time to get your thinking cap on and see how many Sudoku puzzles you can conquer! Vancouver – NGRAIN, a leading provider of interactive 3D equipment simulation solutions for maintenance training and support whose head office is in Vancouver, has announced that the company is opening an office in Richmond, Virginia. The NGRAIN Virginia office will provide direct support to the company’s local and East Coast customers, which include the Department of Defense and the Department of Homeland Security armed services. Over the past year the United States Coast Guard (USCG), United States Marine Corps, US Army, and US Air Force have continued their commitment to training transformation by selecting NGRAIN® Virtual Task Trainer and NGRAIN® Producer software to provide personnel with enhanced learning and improved maintenance support. In use across the armed services, the NGRAIN Virtual Task Trainer is a commercial-off-the-shelf (COTS) software-based solution that leverages 3D simulation to deliver installation, maintenance, repair and — most recently– medical training. Montreal – Ubisoft Montreal has announced a record first week sales performance for Assassin’s Creed™ II, with 1.6 million units sold through worldwide according to internal estimates. This represents 32% growth over the first week sales of Assassin’s Creed. 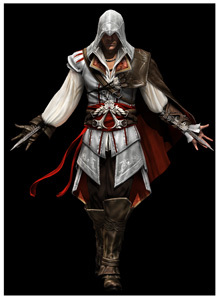 Launched in November 2007, Assassin’s Creed remains the fastest selling new video game intellectual property ever in the U.S.
Assassin’s Creed II invites players to become Ezio, a privileged young noble in Renaissance Italy who’s been betrayed by the rival ruling families of Italy. 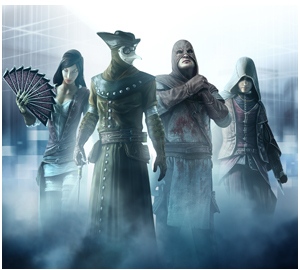 Ezio’s subsequent quest for vengeance plunges players into a captivating and epic story that offers more variety in missions, surprising and engaging new game play elements, diverse weapons, incredible depth and lasting appeal and a profound character progression that will appeal to fans of the original Assassin’s Creed as well as entice players new to the brand. Edmonton – BioWare™ has announced that it has set a new record for site traffic at DragonAge.com and new user registrations at its social networking site, Social.BioWare.com. With the release of Dragon Age™: Origins, the BioWare community has grown to a record 5 million registered users, propelled by outstanding word-of-mouth buzz amongst fans of the 90-rated role-playing game. As of October 13, 2009, DragonAge.com became the most highly trafficked web site in the EA network in 2009, including the main hub, EA.com. Dragon Age fans also drove the game’s Facebook® fan page to 30,000 fans since the page launched in June 2009, making it the fastest-growing EA property on Facebook – a remarkable feat for a new original intellectual property. The soon-to-be-released Mass Effect™ 2 saw a 33% increase in site traffic with the announcement of the Collectors’ Edition on November 4th, and a release of a video featuring the enemies of Mass Effect 2 on November 5th. Today, BioWare is re-launching MassEffect.com with a new design and more connectivity to BioWare’s social networking community at Social.BioWare.com, which has registered over 500K sign-ups in just five weeks, since its launch on October 13, 2009. Brace yourself for high impact, fast-paced gaming! A.D.D. is just Another Dumb Distraction. Blast through 70+ mini games jam-packed with humor, culture, controversy, and personality. Clean and quirky graphics combined with truly unique games will push your device and brain to the limits. Gormley – Digital Leisure announced yesterday that their latest WiiWare title, Copter Crisis, will be available in North America on Monday November 30 for only 500 Wii Points. As an elite Helicopter Rescue Squadron pilot, players are assigned to respond to any type of emergency anywhere at anytime. As the most recent member joining this elite rescue squad, rookies have to complete training missions and become familiar with the latest in helicopter rescue technology. Once the Captain thinks his latest trainee is ready, players are tasked with executing rescue missions all around the Black Wolf Canyon. The Wii Remote™ becomes the control stick as players guide their copters along the canyons while avoiding falling rocks, severe weather conditions and even anti-aircraft fire! Tasks include rescuing lost hikers, delivering supplies to remote areas, assisting on scientific missions and even blasting your way into hidden underground cavern systems. Complete all of the objectives to rise through the ranks, taking on the toughest of rescues in more than 30 missions. 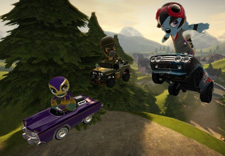 Copter Crisis uses the Nintendo® Wi-Fi Connection Pay & Play and can connect up to 10 additional military copters at one time. London ON – Big Blue Bubble Inc. is pleased to announce that their smash hit Home Sweet Home has arrived at Apple’s App Store! Home Sweet Home will give you the chance to unleash your hidden talents as an Interior Designer. You choose the furniture, patterns, and colors to create a masterpiece that will blow your client away. Picture the scene. You move into a new house and you have visions of how you want every room, except for one. Sure, there are some items you know you need in that room but, other than that, it’s a blank canvas. Who do you call? How about the ‘Home Sweet Home’ team? Learn about your clients to ensure you are designing the perfect room for their tastes. Next, choose the furniture, choose the colors and patterns and place items around the room until the design is perfect. Then direct your build team of workers to assemble it all in front of your eyes! With simple controls, a fun graphical style, and an easy to use interface, Home Sweet Home allows you to nurture your creative side. Remember – a house is not a home until its ‘Home Sweet Home’!